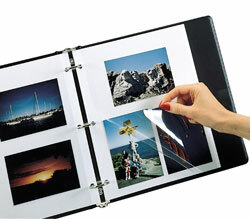 Self-adhesive photo holder lets you attach photos to files, binders, reports... almost anywhere. Store photos almost anywhere by using the self-adhesive feature of this poly holder. Storing photos in the Peel & Stick Photo Holder will help to keep them in their original state and remain visible. Self-adhesive photo holder lets you attach photos to files, binders, reports... almost anywhere. Holds Polaroid, 3-1/2 x 5 and 4 x 6 photos. Acid-free polypropylene. 10/PK.